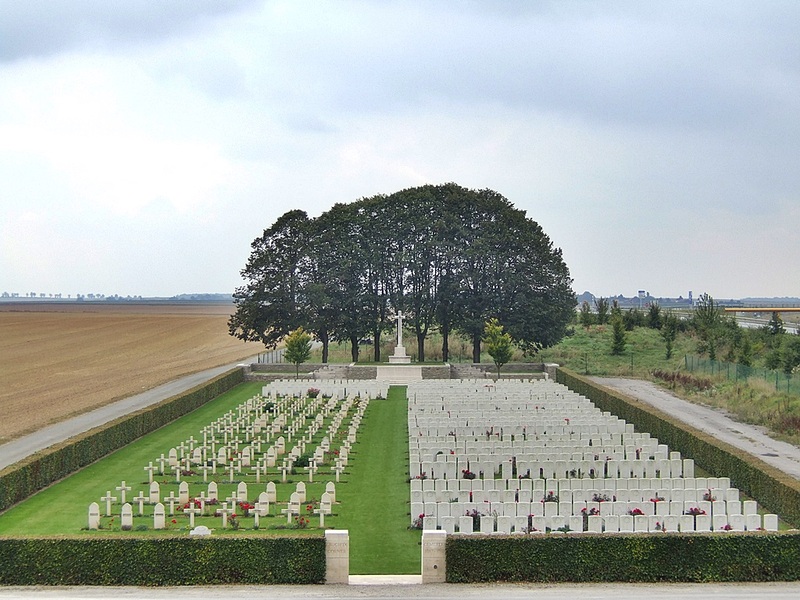 Villers-Bretonneux is a village in the Department of the Somme, and lies on the N29 road from Amiens to St Quentin. 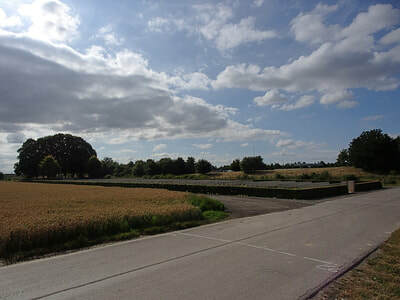 Enter the village of Villers-Bretonneux on the D23 heading south. 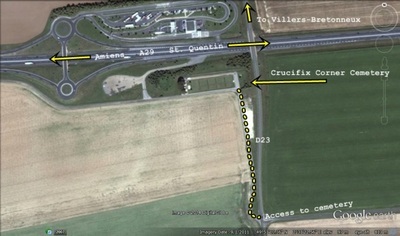 At the crossroads head in the direction of Demuin and Moreuil, remaining on the D23. 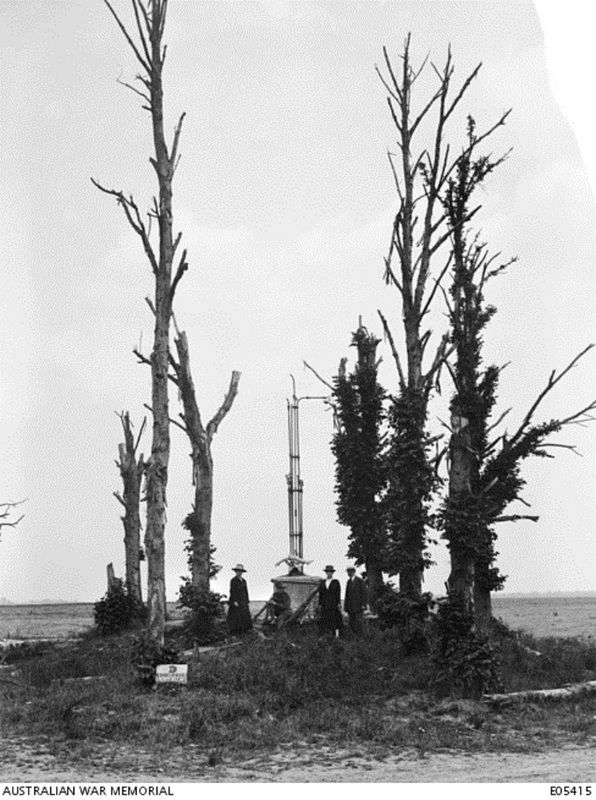 Two CWGC signposts will be seen. On leaving the village, carry on south for 2 kilometres, still on the D23 Demuin road. 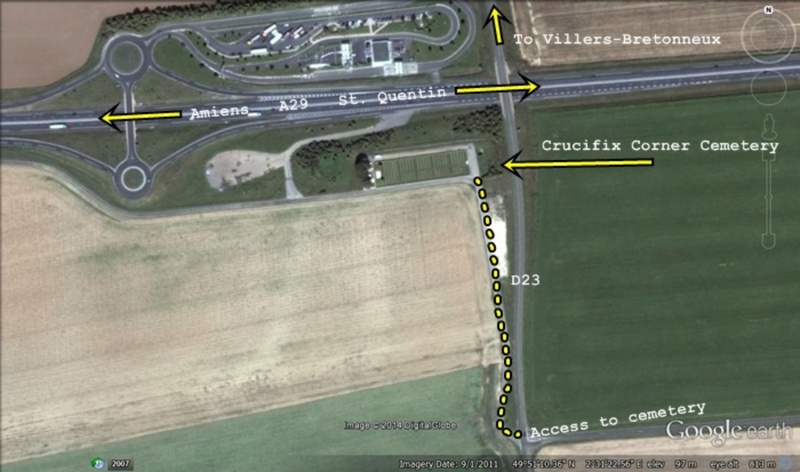 After passing over the A29 Motorway (Amiens-St Quentin), the cemetery is signposted down a side road on the right. The site became famous in 1918, when the German advance on Amiens ended on 23 April in the capture of Villers-Bretonneux by German tanks and infantry. 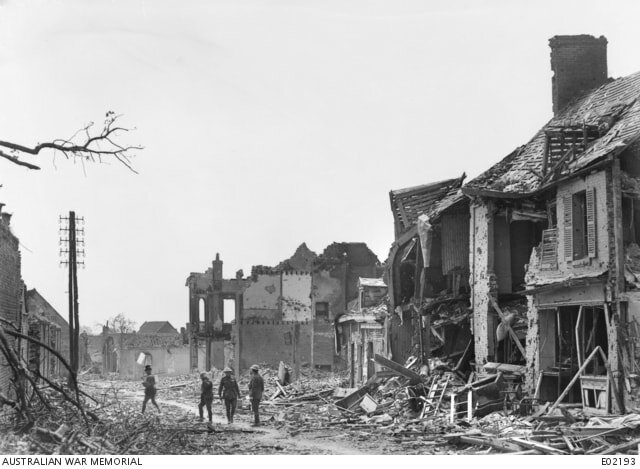 On the following day the 4th Australian and 5th Australian Divisions, with units of the 8th and 18th Divisions, carried out "an enterprise of great daring", (Sir Douglas Haig's Despatch of 20 July 1918) and recaptured the whole of the village. VAIRE WOOD CEMETERY, VAIRE-SOUS-CORBIE, near the West side of the Bois de Vaire. 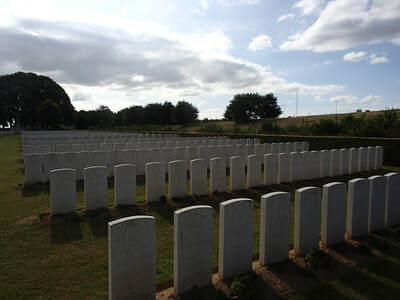 Here were buried 26 soldiers from Australia and one from the United Kingdom who fell in July and August, 1918. 21st July 1919. 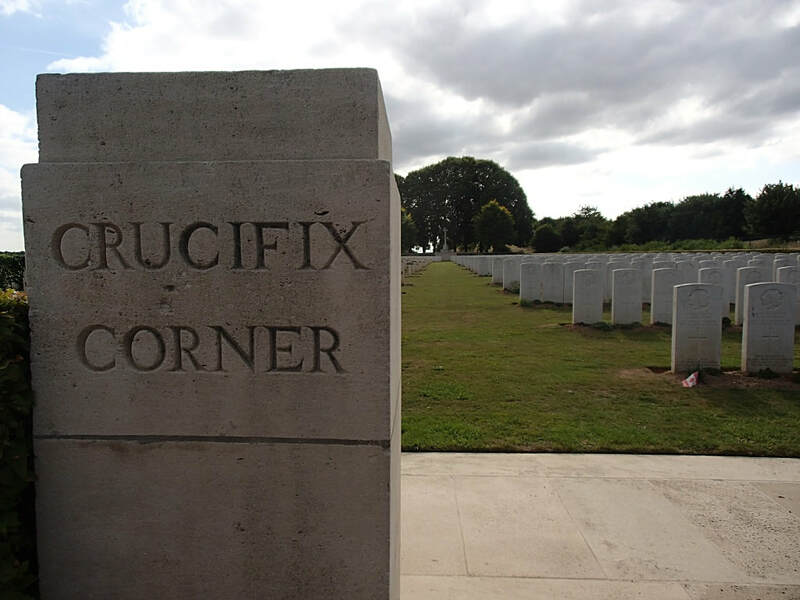 The Crucifix Corner Cemetery in which Australian, Canadian and British soldiers are interred. 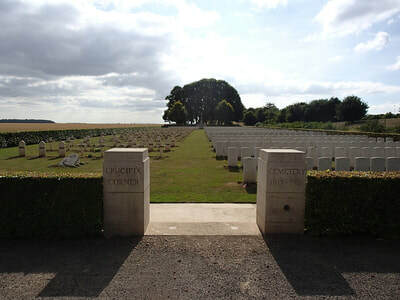 This cemetery increased in size after the Armistice because of the relocation of graves from the battlefield sites. 5th April 1918, aged 32. Son of John E. and Mary Banks, of 264, Garston Old Rd., Garston, Liverpool. 3rd April 1918, aged 26. From Dundee, NSW. A carter before enlisting in April 1916, Pte Bounds left Australia with the 2nd Reinforcements in September 1916 and arrived in France for service on the Western Front in January 1917. Gassed during the 3rd Division's attack at Messines in June 1917, he was admitted to hospital at Le Harvre before rejoining his unit in August 1917. 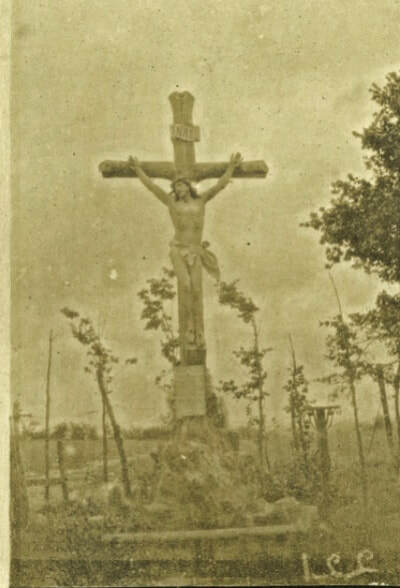 He was killed by artillery fire during the German attack on Villers-Bretonneux. 18th July 1918, aged 27. Son of George Isaac Bridge, of 4, Harwood Terrace, Fulham, London England. When joining up, was in service with Assistant Governor General. ​A native of Chelsea, England, Pte Bridge of Malvern, Victoria, was employed as a footman to the Governor of Victoria, Sir Arthur Stanley prior to enlistment on 29 September 1916. He embarked from Melbourne aboard HMAT Medic on 16 December 1916 for Plymouth, England. Pte Bridge joined his unit in France on 14 May 1917. 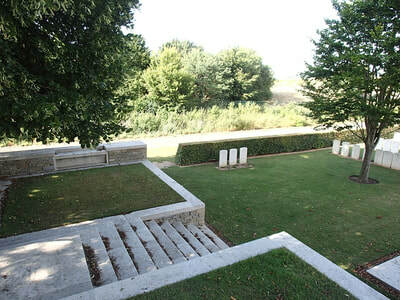 He was hospitalised in France and England with trench fever and influenza for a period of two and a half months before rejoining his unit on 14 May 1918. Pte Bridge was killed in action on 18 July 1918. From Llandilo via St Marys, NSW. A professional soldier, he embarked from Sydney aboard HMAT Nestor (A71) on 28 February 1918. On 8 August 1918, he was killed in action near Amiens, France. 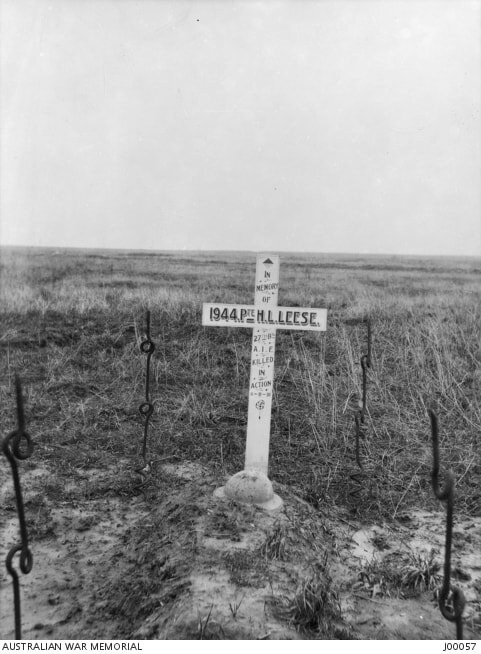 Surrounded by wire posts and a tin helmet, the isolated grave of 1944 Private Harold Leslie Leese, 27th Battalion, enlisted Broken Hill, NSW, killed in action 8 August 1918, in Crucifix Corner British Cemetery. He is now buried in Plot IX. B. 2. 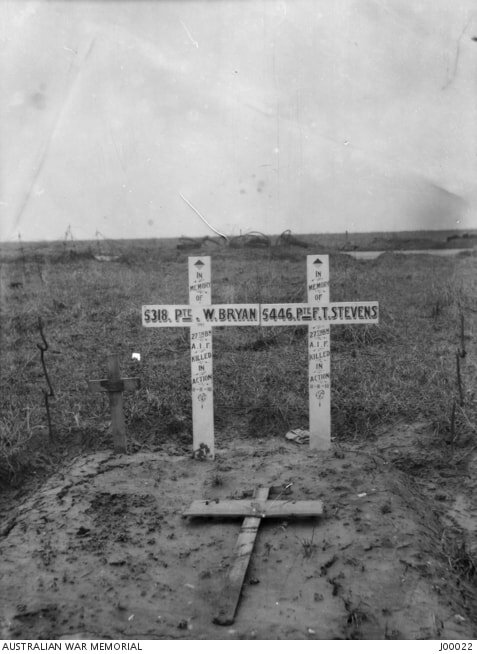 The grave of 5318 Private (Pte) Fredrick Mark Bryan MM (alias of William Bryan) of Melbourne, Vic, and 5446 Pte Frederick Thomas Stevens of Snake Valley, Vic, both of the 27th Battalion, killed in action 8 August 1918, in Crucifix Corner British Cemetery, Villers-Bretonneux. There are also two unidentifiable crosses on the gravesite. 17th July 1918, aged 26. Son of Charles Martyn Davies and Lucy Amelia Davies, of 121, Brunswick St., Fitzroy, Victoria, Australia. Native of Heidelberg, Victoria. From Heidelberg, Victoria. A salesman prior to enlistment, Pte Davies embarked from Melbourne with the 17th Reinforcements on HMAT Euripides on 4th April 1916. After transferring to the 25th Battalion he was killed in action on 17th July 1917. He was initially buried where he fell but, following the Armistice, was re-interred in the Crucifix Corner British Cemetery near Villers-Bretonneux. His brother 185 Sergeant Herbert Martyn Davies was killed in action on 22nd July 1916 and is buried in the Estaires Communal Cemetery and Extension. 8th July 1918, aged 24. Son of Arthur and Eliza F. Dixon, of "Lyndock," Kitchener Avenue, Victoria Park, Western Australia. Native of Adelaide, South Australia. Harry was a cabinet maker and a member of the Western Australian Infantry Regiment prior to the war. 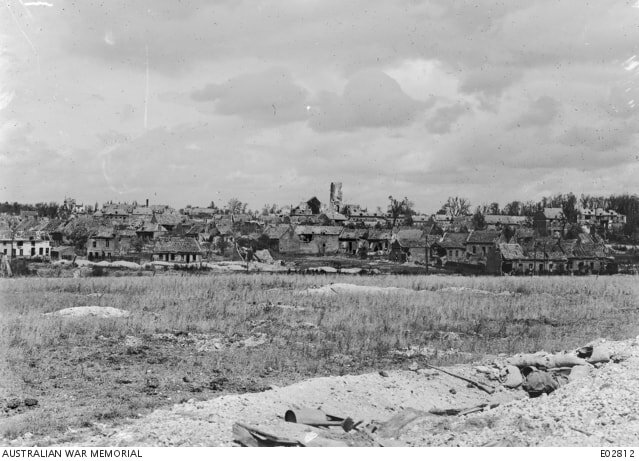 Joined the 16th Battalion, 3rd reinforcements and landed at Gallipoli 25th April 1915. Wounded 9th May. Rejoined the battalion and was wounded a second time in France in August 1916. Killed in action, Vaire Wood 8th July 1918 and buried at Crucifix Corner Cemetery. From Lithgow, NSW. A furnaceman prior to enlisting, he embarked from Sydney aboard HMAT Nestor (A71) on 9 April 1916. He was killed in action near Villers-Bretonneux, France on 1 July 1918, aged 26. 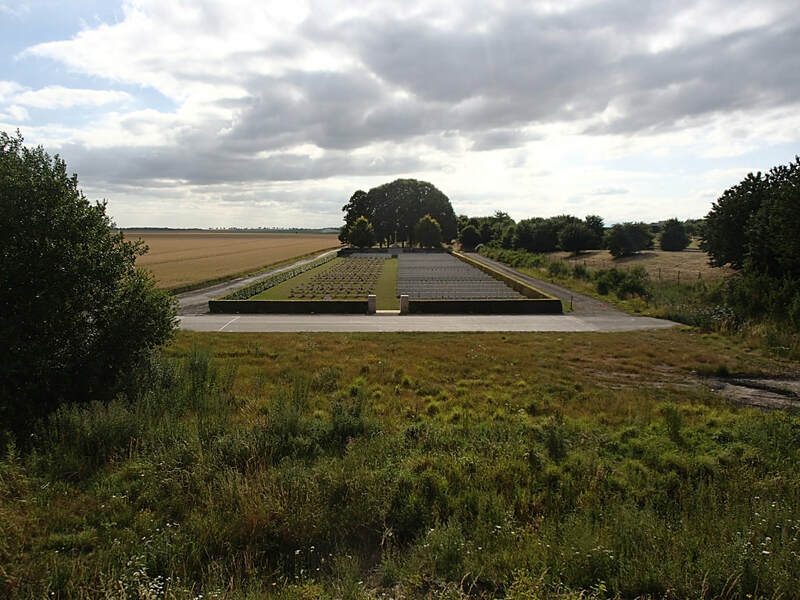 "Going out to take a Machine Gun post at Villers-Bretonneux, he and the officer (Whose name I don't remember) went forward but ran on to the post unawares. Hatton got a lot of M. G. bullets which blew half his head off, killing him instantly. He was the only one killed in the raid." 25th July 1918, aged 24. Son of John Charles and Annie Maria Hunt, of Harold St., Parramatta, New South Wales. Native of Dural, New South Wales. From Cobargo, NSW. A bank clerk prior to enlisting, he embarked from Melbourne aboard the HMAT Nestor (A71) on 28 February 1918. He was killed in action at Villers-Bretonneux, France, on 25 July 1918, aged 24. 17th April 1918, aged 23. Son of Allan Thomas and Sophia Josephine Jarrett, of Narracoorte, South Australia. A wheelwright from Naracoorte, South Australia, embarked for Egypt with his older brother 3165 Private Thomas Charles Bertram Jarret, from Adelaide aboard HMAT Medic with the 7th Reinforcements of the 27th Battalion. In early April 1916 they were both transferred to the 32nd Battalion which relocated to the Western Front, France, in June 1916. 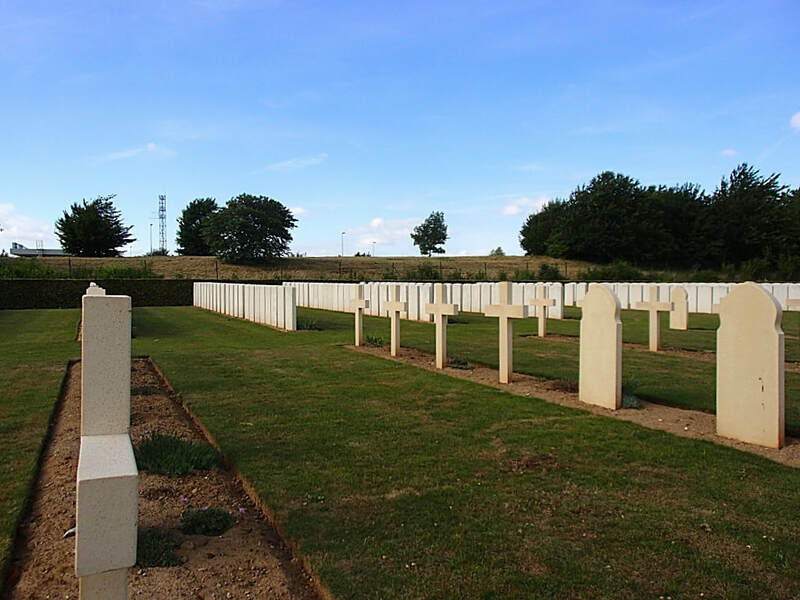 Pte Thomas Jarrett was wounded in action on two occasions, the first with shell shock during the Battle of Fromelles on 19 July 1916 and then due to gassing in May 1918. On both occasions he was evacuated to England for treatment and recuperation; he was still recovering from the gas attack at the end of the war and returned to Australia for discharge in October 1919. Pte Allan Jarrett was hospitalised in France due to illness after the Battle of Fromelles and rejoined his unit at Trones Wood in February 1917. He was promoted to Temporary Corporal in August 1917. Cpl Jarrett was killed in action near Corbie, France. 15th April 1918, aged 21. Son of James and Alvina A. Manuel, of Hyman St., Tamworth, New South Wales. Native of Uralla, New South Wales. From Tamworth, NSW. Pte Manuel enlisted on 5 July 1915 and embarked from Sydney aboard HMAT Themistocles on 5 October 1915. He later served with the 53rd Battalion and died of wounds received at Villers-Bretonneux on 15 April 1918, aged 21 years. 43rd Bn. Australian Infantry, A. I. F.
4th July 1918, aged 25. Son of Patrick John and Agnes Julia O'Brien, of Anthony St., Largs Bay, South Australia. Native of Adelaide, South Australia. A bookkeeper from Broken Hill, New South Wales, prior to enlistment, he embarked with the 12th Reinforcements from Adelaide on 16 December 1916 aboard HMAT Berrima for Devonport, England. 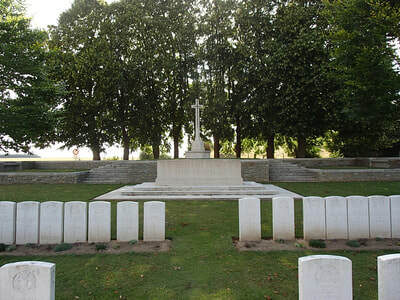 He retained the acting rank throughout the voyage and for the duration of training in England, reverting to the rank of Private on 8 October 1917 when he transferred to the 43rd Battalion at the Western Front near Ypres, Belgium, and was appointed to the rank of Lance Corporal a month later. L Cpl O'Brien was killed in action near Hamel, France. 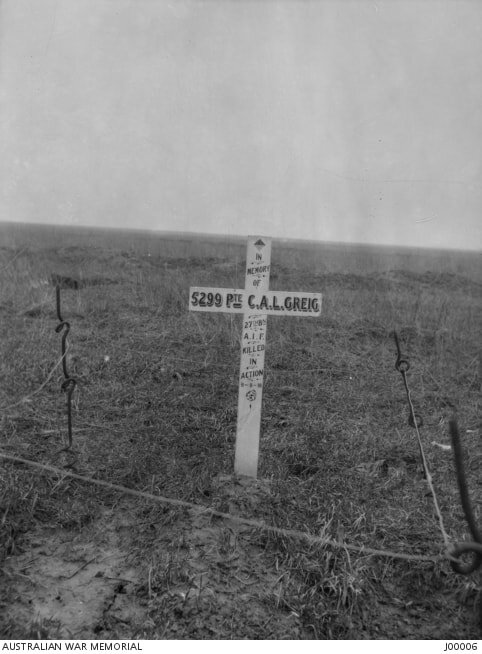 Original grave at Crucifix Corner of 4203 Lance Corporal, Henley Brinley Round, 27th Bn. Australian Infantry, A. I. F. 6th July 1918. Now buried in Plot IX. A. 7. 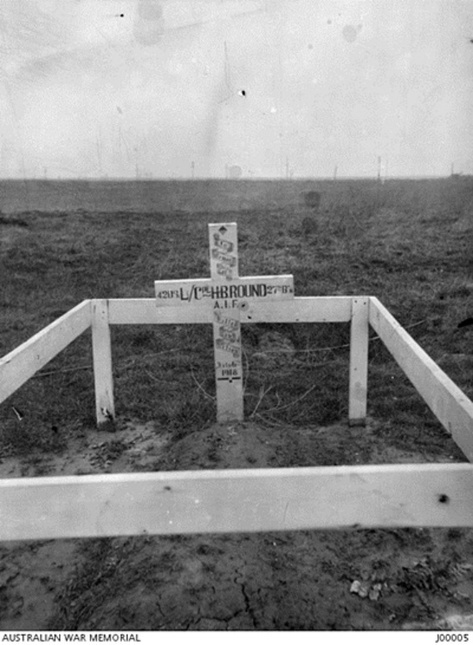 The grave, of 5299 Private Colin Alan Longbourne Greig, B Company, 27th Battalion, who enlisted Grange, SA, and died of wounds 8 August 1918, in Crucifix Corner British Cemetery one mile south south east of Villers-Bretonneux. The grave has been surrounded by wire. 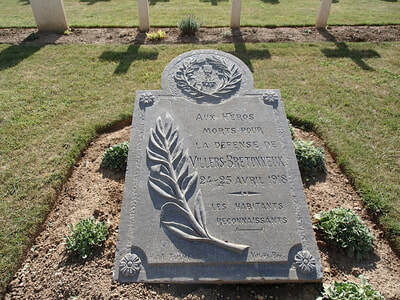 His grave was later moved to the Villers-Bretonneux Military Cemetery. 3rd May 1918, aged 21. Son of Peter James and Isabella Skjellerup, of Ondit, Victoria, Australia. Native of Cobden, Victoria. From Ondit, Vic. A farmer prior to enlisting in April 1916, Pte Skjellerup embarked from Melbourne with the 19th Reinforcements on board HMAT Militiades (A28) on 1 August 1916. He arrived in France for service on the Western Front in November 1916 and was wounded in action at Messines, France, on 11 April 1917. He returned to his unit in July and in December was appointed Lance Corporal (L/Cpl). 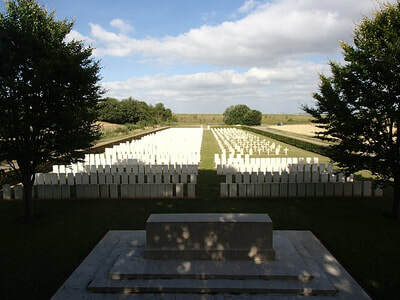 L/Cpl Skjellerup was killed in action at Villers-Bretonneux, France. 17th July 1918, aged 28. Son of James Patrick and Louisa Ellen Sullivan, of Tweed Heads, New South Wales. Native of Smithtown, New South Wales. 27th April 1918, aged 25. Son of the late Charles Henry and Ellen Twight. Native of Melbourne, Australia. From Northcote, Victoria. A 24 year old storeman prior to enlisting on 19 May 1917, he embarked for overseas with the 9th Reinforcements from Sydney on 16 July 1917 aboard HMAT Port Melbourne. After further training in England, he joined the 60th Battalion in France on 13 January 1918. 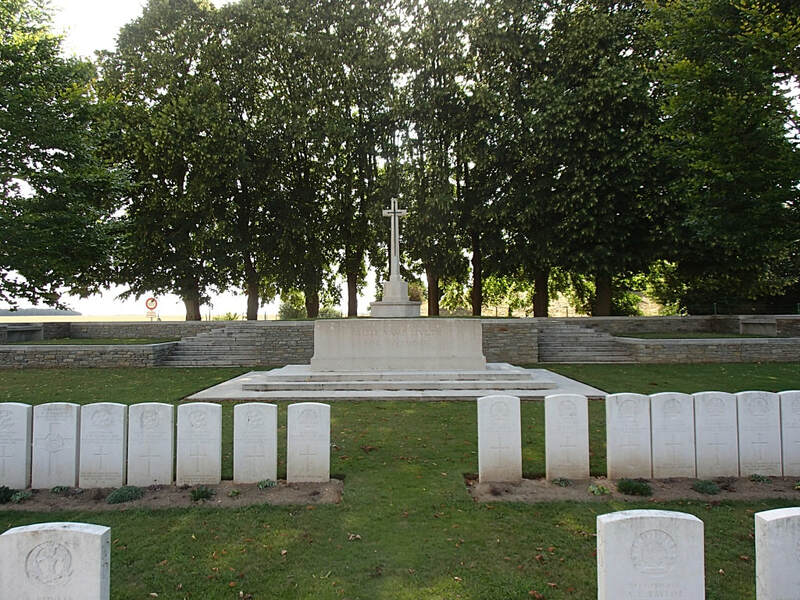 Pte Twight was killed in action on 27 April 1918. 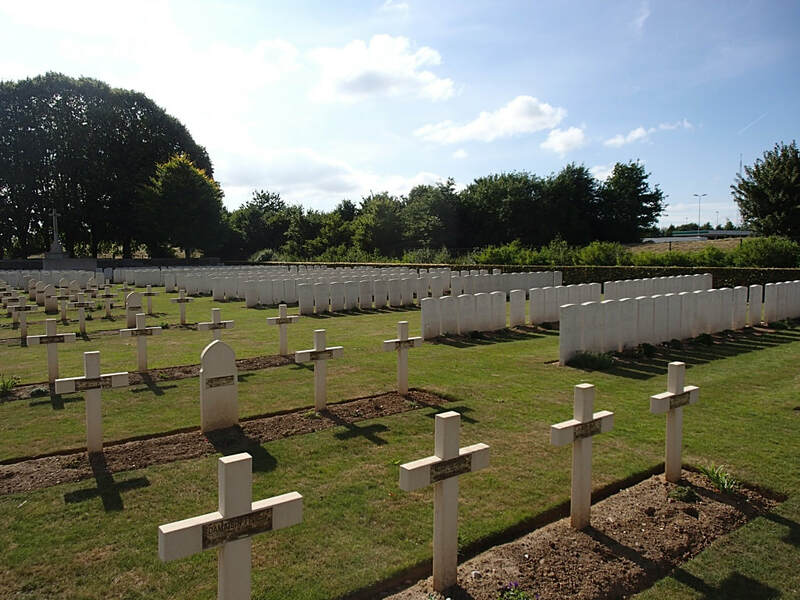 ​Charles Twight was killed by a shell on 27th April 1918 close to Villers-Bretonneux, his body had to be left in No Man's land. Later, the 14th Battalion Australian Infantry took over the line and found his body identifying it by his wallet, they buried his body and later sent the wallet back to his sister in Australia.